NOTE: Our RUNNER’S GUIDE will have complete race weekend information. The runner guides for each race will be available the weeks leading up to the races. Will this get me into Boston next spring? Until the Boston Athletic Association announces their registration schedule in late summer, we will not know exactly where we fall in the Registration Calendar. But we like our chances. Or the first day of General Registration (all qualifying times) the Monday after the race. With no one able to be sure, we are your best chance for a last shot at next spring’s Boston. We will keep you posted as we hear more from the BAA in summer, and as early registration progresses in September. 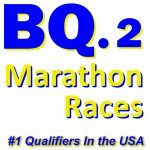 What race finish times do I need to make me eligible for the BQ.2 Marathon Races? Please see our eligibility page for a current list of requirements. Can I use the half split of a full marathon to be eligible? No, sorry but we accept only official finish times. Once you are filled, do you have a waiting list, or can you ignore everyone else’s request and make an exception just for me please? Sorry but once we are filled, we do not have a waiting list, nor do we make any exceptions to our course capacity limits. 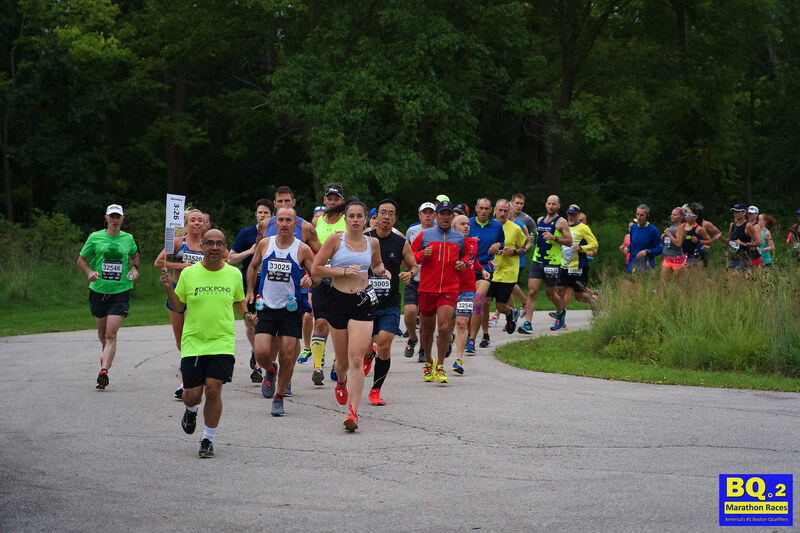 In addition, there are absolutely NO exceptions to eligibility requirements unless the race is not filled by 7/1 (fall race) or 3/1 (spring race).Runners expect and deserve a great shot at their qualifying time, and too many runners on the course would be detrimental to their chances. Thanks for understanding, and check out our website home page for great alterative options to get you to Boston. What are the Pace Team times? Pace teams will target finishing 1 minute under each qualifying standard so that finishing with your group not only gets you a qualifying time, but a time that will get you to the starting line. See our Pace Team page for details. How will the Elite water bottle tables work? Get ready – you are about to be treated like an elite runner! Just bring your own water bottle filled with your (preferably non-performance enhancing, non-alcoholic) drink of choice, and marked with your bib#. (Bib numbers and marking instructions will be available a few weeks before the race.) Tables of 25-30 bottles each will be available along the route, (see the course map) based on last bib digit. Know your bib#, know your table location, and volunteers at each table will help insure you get the right bottle, and in many cases will be ready to just hand it to you as you run by. If you drink-and-drop in the designated drop zone within 200 yards, we will retrieve your bottle and have it waiting for you the next loop. (as long as it remains properly marked). A Water / Gatorade station will be available shortly after the drop zone in case you miss your bottle on any loop. And the starting line is a special drop zone, so you can keep your bottle with you until the gun goes off. When / where is Packet Pickup? Friday, Race Eve, 11 a.m. – 5 p.m.
Saturday, Race Day, 5:30 a.m. – 6:15 a.m. There is no charge or need to register for race morning pickup. Do you offer gear check? Yes! 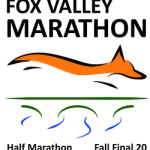 April and September mornings on the Fox River can be cool, (average mid 50’s) so gear check will be available near the starting line to keep you comfortable right up to the starting gun. Absolutely. Our medals have a familiar yellow / blue / silver theme and are always a big hit. All finishers will get a medal regardless of whether or not you meet your qualification goal (but we hope that you do!) as long as you finish within the 4:30:00 time limit. 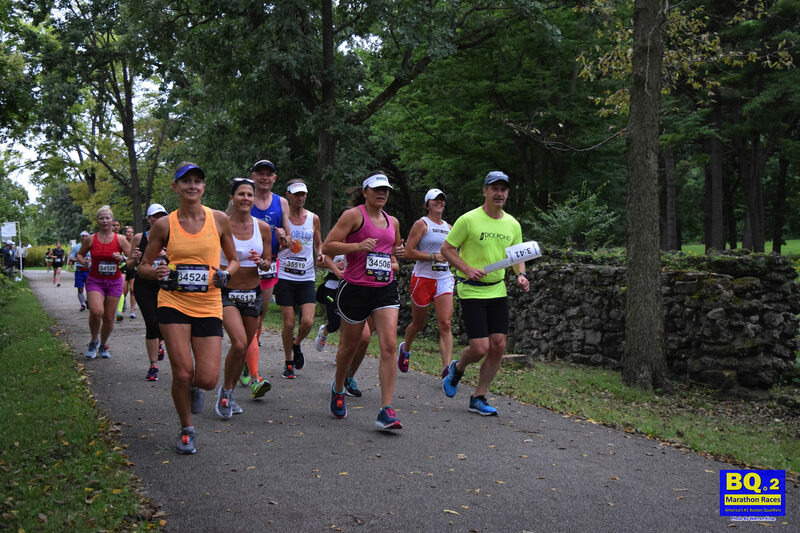 No, the size and purpose of the race make Boston qualification your award. There will be an award for the top Male and Female. Will you offer race shirts? Yes, we will be offering gender-specific long sleeve tech shirts in a bold style you will be proud to show off year round, whether to kick of your Boston training, to wear on a cool Boston race day, or to show off your quest! Is massage available after the race? Yes, the race village will include massage and stretching tents to help you recover quickly from your effort. Does this qualify me for my multi-year Fox Valley Endurance Award? Yes. Besides their Last Chance 26.2 finisher medal, 2, 3, 4, and 5 year Fox Valley Marathon Races finishers can pick up their multi-year Endurance Medal at the finish village Endurance Award tent, and 5 year finishers can also get their 5th year Quarter-Zip at the tent. 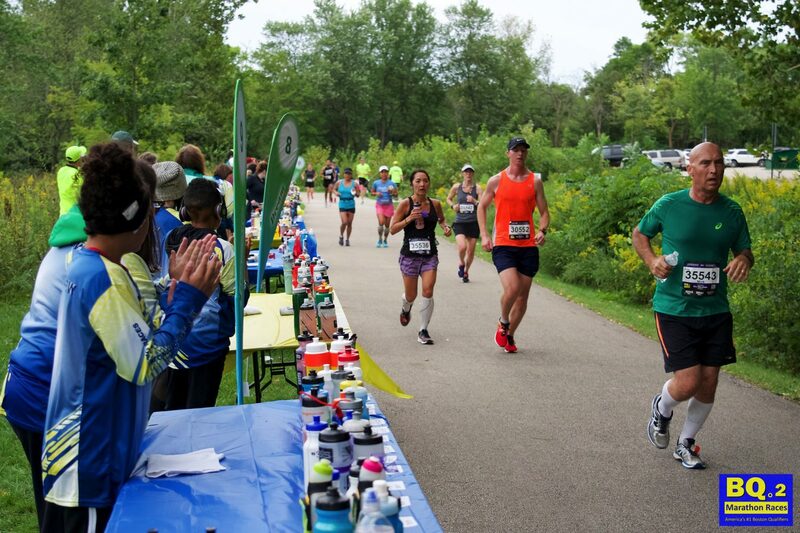 Any Fox Valley Marathon race any year makes you eligible, so if you were not an official Fox Valley finisher last year, this year’s BQ2 will start your streak so running Fox Valley next year will get you a 2-year medal. Does this qualify me for a multi-race Chicagoland Distance Challenge award? The Last Chance BQ.2 (September race) is a qualifying race for the ‘Valley & ‘Ville’ 2-race or ‘Chicagoland Triple Crown’ 3-race medal. If I run both this and Fox Valley the next weekend, is there a Goofy-esque medal? No. While that would be a great feat, but you won’t get an extra medal for it. This race is here to get you to Boston! I’ve registered but cannot run. Can I get a refund, deferral, or transfer? Note, your qualifying time and race window must qualify you for the spring race.